Julong’s multi-pocket sorter JL8010 is the total package. Not only can it be equipped with up to seven output-pockets but it also has an integrated bundling system, making it the perfect solution for cash centers, where large quantities of banknotes are processed. 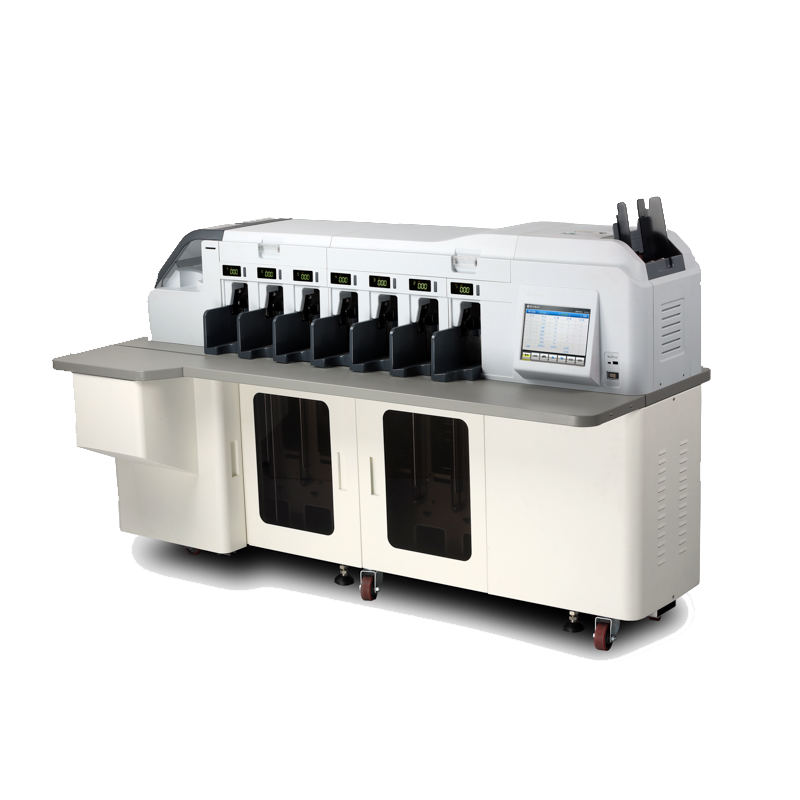 You can even combine multiple JL8010s to form Julong’s fully automated cash processing system, the JL8000. The JL8010 is available in two configurations: 7+1 and 4+2, describing the number of pockets. Any pocket regardless of its “intended” function can be assigned to any parameter, allowing you to fully customize your cash handling process. Once the set number of banknotes, for the individual pocket, is reached the notes are transported to a lower level and move to the bundling station. There they are looped with a paper ribbon and stamped. The strapped bundle then exits the machine and can be collected for further processing. The JL8010 offers full automation for you sorting and bundling process, minimizing the potential for error, while simultaneously increasing workflow efficiency and throughput. The entire transportation route is straight and flat, which greatly reduces the risk of jamming or banknote overlay. And although the JL8010 is a closed system, keeping the operator from being exposed to the dust emitted by the processed banknotes, every part of it can be easily accessed. So in the unlikely event of a jam the problem can quickly be fixed without significantly stalling the process. The detection module within the JL8010 contains three CIS image detectors and one light source. The entire surface area is photographed and scanned on both sides of the banknote, ensuring that any irregularities are detected. The abundance of sensors raises the security of the cash handling process to the highest level, unmatched by competing machines. The software programming ensures that new currencies can be easily integrated into the system, giving the machine unrivalled longevity. The JL8010 is equipped with Julong’s patented concept of “virtual pockets”. Once a pocket reaches its limit the banknotes are put in a depository, thus freeing up the pocket for further processing. The banknotes in the depository are either pushed to the front, where they can be collected, or move down to the bundling station. This allows for a continuous use of every available pocket, and a smooth workflow. Each pocket can thus be used twofold: for processing and holding, effectively doubling the amount of available pockets. The three presented features: straight transportation line, the image recognition module, and the concept of “virtual pockets” were all pioneered by Julong and are unique to Julong machines. The operating system of the JL8010 ensures that the cash handling process is transparent, accountable, and safe. The system tracks a multitude of useful data and information, such as customer ID, date, time, number of notes, split ratio, request for service, etc. It will recognize each banknote’s individual serial number, fully decode it and make it available for further database processing. The intelligent software applications let you track the entire cash handling process in real-time while maintaining the highest security standards.